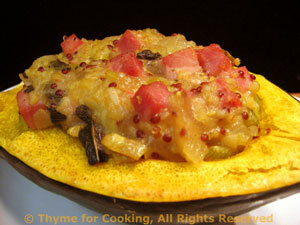 Stuffed Acorn Squash with Ham and Quinoa, Thyme for Cooking gourmet menus. As long as we're at the deli counter getting ham, might as well get enough for this. Acorn squash is perfect for stuffing: they're small with a large, hollow center. 1 squash is a perfect size for 2 people. South American quinoa makes this a very 'new world' dish.